Hallo Yay, how are you? It’s a polite way to greet a Cambodian granny and this old lady’s face broke into a huge grin, revealing two missing teeth in the front. The warmth in her huge smile was evident. The deep brown eyes creased in pleasure and the lines already etched into her face became a bit deeper. Cambodians smile with the eyes, nearly every time and it doesn’t take much to get a heart-felt smile like this one. Just a spattering of bad Khmer did the trick this time. The simple words – hallo grandmother, how are you? Delighted her. “Jah, sok sabai,” she said — yes, I am fine. Her face still creased with smile lines and her arms were waving as she chattered away, too fast for us to keep up — except for a few phrases. “Sok sabai yay, sok sabai yay,” she kept repeating, smiling every time. She, of course, returned the greeting asking how we are and we could also reply. Our simple exchange of a standard greeting clearly pleased her and she gave us far more credit for our little conversation than we deserved. “Jeh khmer” she kept saying — know Cambodian — and laughing all the while. I’ve borrowed a scooter and so my friend Alida and I headed out to the West Baray for a morning jaunt on the bikes. 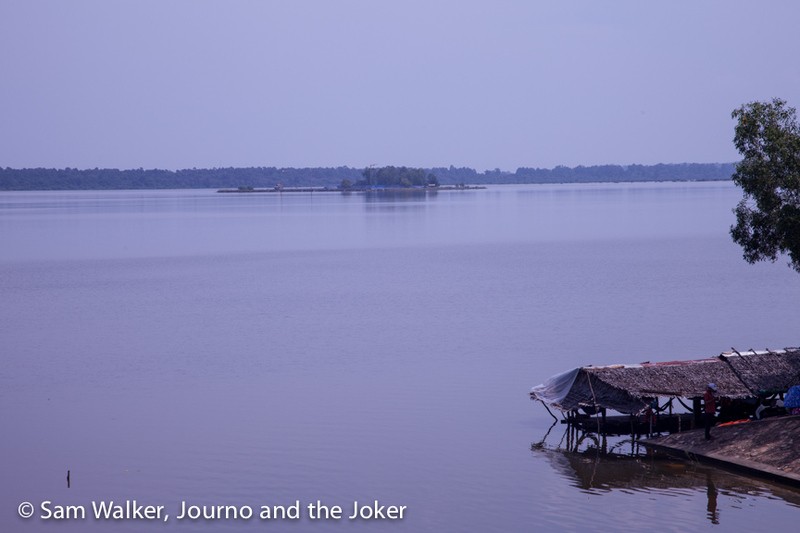 It was so good to see the baray full of water. Last time I was there it was almost empty. 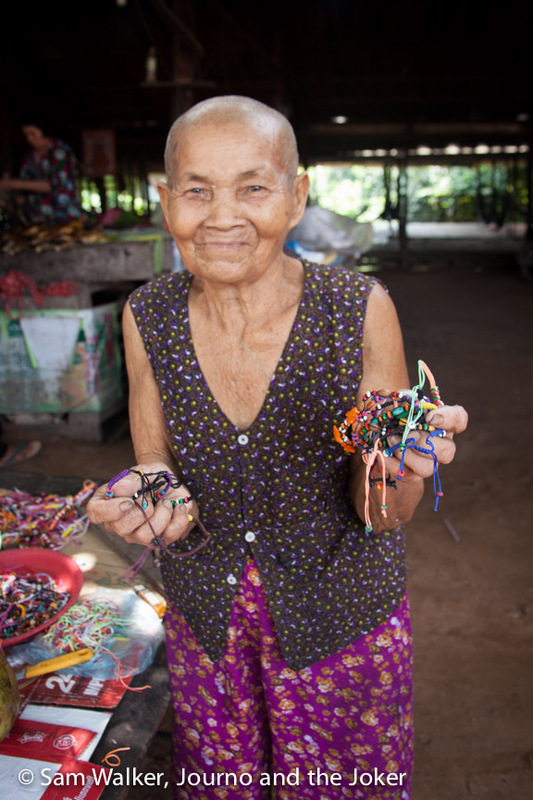 We stopped for a refreshing ice cold coconut and this lovely Cambodian grandmother was selling colourful bracelets she makes with her gnarled old fingers, for a mere 1000 riel (25 cents). We bought one each and gave her double the going rate. She was busy this morning, as the yays often are. Fussing over a big pot of something she had brewing away but she was happy to sell us her bracelets. 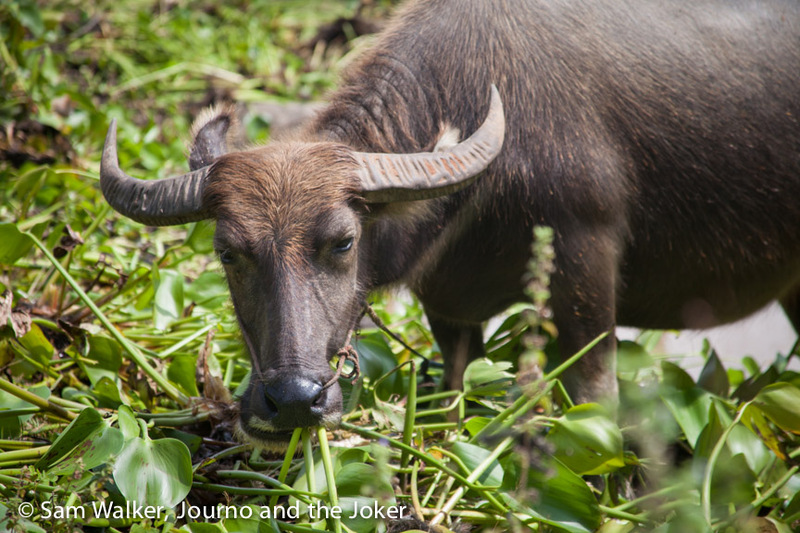 Earlier in the morning, on our way out to the baray we’d stopped to photograph some buffalos, enjoying a juicy snack of water hyacinth. While we were taking pictures an old grizzled man with bandy legs pulled up on a bicycle to chat to us. We conversed haltingly with his spattering of English and our few Khmer phrases. He had no reason to stop – he just wanted to say hallo and talk to us. Sadly, we got on our way before I snapped his photograph. There is just no accounting for warmth like this and it puts a smile on your face for the rest of the day. But the friendly exchanges didn’t end there. Our third encounter was with a group of young monks sitting under a tree. We pulled up on our scooters to have a look at the pagoda and several of them called out “hallo”. They love the opportunity to talk to foreigners as it enables them to practice their English but often they are too shy to speak. You know what it’s like when you’re learning a language, it’s daunting practicing with a native speaker. Getting out of the city and exploring the countryside is one of my favourite things to do. You see some wonderful scenery and interesting sights. And you will nearly always hear children calling out “hallo”. Sometimes an adult will call out “hallo barung”. Some people just smile or wave. Tuk tuk drivers are knowledgeable and always happy to take you on an adventure into the countryside. Depending on the time of year, you might find yourself seeing rice planted or harvested or other rural activities. You might find hidden treasures like a beautiful pagoda in the middle of nowhere. The advantage of taking a tuk tuk is that you can go further and the drivers will often share their local knowledge and tell you the story behind certain things. The price will vary depending on how far and for how long you go. It could be $10 to $20 or more if you go a long way and make a day of it. Siem Reap is flat, so it is incredibly easy to get around. You can hire bikes from between $1 and about $5 per day. Personally, I am happy with the some-what daggy looking city bikes with their basked on the front and high handle bars. If you get a good quality one with a good seat I find them pretty comfortable. Others prefer a more heavy-duty mountain bike for bouncing around on the back roads and dirt tracks. It’s good to have a general idea of where you are going but it is fairly easy to get around town and the surrounding areas and the city changes from urban to rural in just a few kilometres. Don’t forget to take plenty of water with you. An e-bike adventure can be a lot of fun. So many places around town hire them out these days and they cost about $10 for 24 hours, which is not bad. A few re-charge places can be found in town, but if you are venturing further afield keep a close eye on the battery levels. E-bikes are a fun way to see some of the countryside and get outside the urban areas of the city. Just remember the roads are crazy and to be very cautious. Accidents are common in Cambodia. Enjoy your experience and make sure you say hallo to the locals. You might find yourself having a chat to a Cambodian granny, which is likely to put a big smile on your face for the rest of the day.